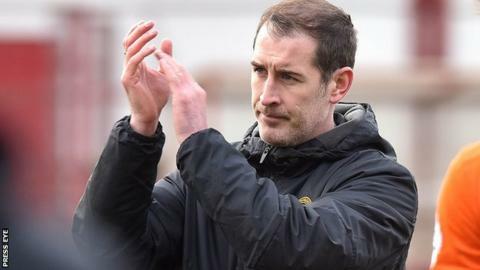 Carrick Rangers will contest a charge relating to manager Gary Haveron which could result in the club being relegated from the Premiership. The Irish FA has charged Carrick with a disciplinary breach concerning the failure to implement Haveron's touchline ban against Dungannon. Punishment would include the forfeiture of the match, with the loss of three points leaving Carrick bottom. Rangers said they would make a further statement following legal guidance. Carrick are in the dock over a breach of Article 23.1 of the IFA Disciplinary Code over Haveron's presence within the technical area during their victory against the Swifts on 23 April. The sanction is a minimum fine of £350 and forfeiture of the match on a 3-0 scoreline. If Carrick are stripped of the three points, they could be automatically relegated, putting Warrenpoint into the play-off and Ballinamallard would be safe. The decision would also render Ballinamallard's first leg promotion-relegation play-off victory over Institute invalid. Meanwhile, Portadown must attend a further hearing over the registration of Peter McMahon. Following a player registration sub-committee's investigation into player payment irregularities in April, the IFA's disciplinary committee has asked the Ports to attend another hearing.